Apart from going back to work, the collective comedown after Christmas is made all the worse when the time comes to take the tree down. Packing away the baubles for another year, getting caught up in tinsel and trying to carefully rearrange the lights so they don’t get tangled when you get them out again are as much a post-Christmas tradition as the big day itself. And you know those lights will be in knots next year. Then there’s the all the little Christmas tree needles that have dropped all over the floor and got themselves into areas you didn’t even realise existed. You’ll be finding those pesky little guys the whole year round, unless you’ve opted for a fake plastic tree, that is. 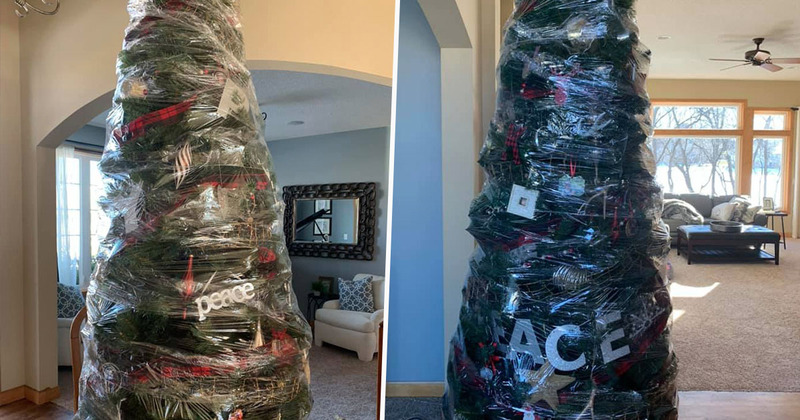 One mum’s method for coping with the Christmas cleanup has gone viral however, thanks to her time-saving trick and clever use of cling-film. My new time saving Christmas tree invention. No more decorating/un-decorating. Wrap it and store it! Really! Just wrap it with Saran Wrap? It’s a roll of plastic our builders left. They use it to cover the carpet. I’ve had it for years and figured out how to use it today! 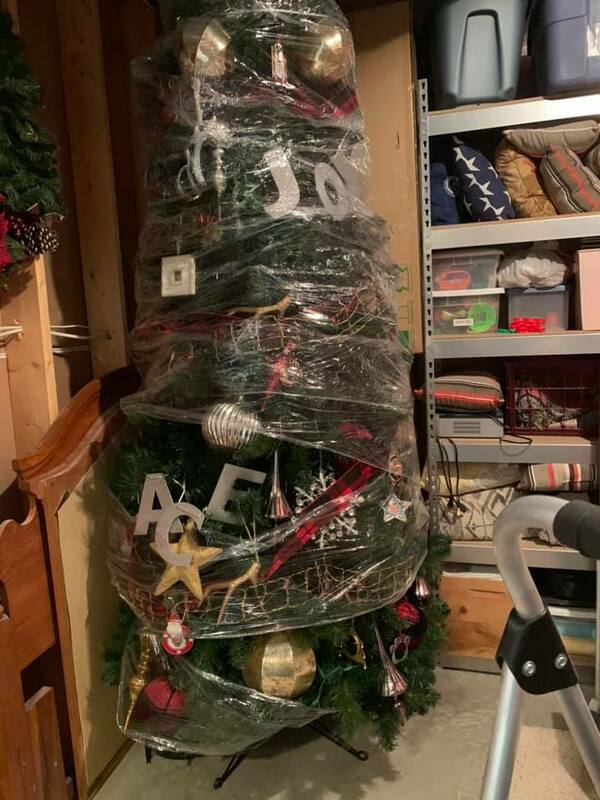 Doing away with the faff of taking the decorations off only to put them back on next Christmas, Renae has ingeniously just wrapped her tree in a shed load of what looks like some industrial-strength cling film. I’m assuming she has a garage or an attic with enough space to store it out of sight for a while! The whole tradition of bringing trees inside and whacking on some festive decorations started in Germany in the 16th century, according to History. It is believed that Martin Luther (the 16th century German Protestant reformer) introduced the idea of putting lights on trees. It is said Luther was walking home one evening when he saw the stars twinkling through the evergreen trees in winter. To recreate the scene for his family when he got home, he put up a tree in his house and wired its branches so they could hold lit candles. Did he then thrown some cling film around it so it could whip it out the same time next Christmas? I doubt it. Americans, on the other hand, didn’t take favourably to Christmas trees until around the 1840s. Up until then, they apparently saw them as pagan symbols. Since then, however, Americans have embraced the tradition, with the famous annual tradition of the tree at Rockefeller Centre starting in 1931. 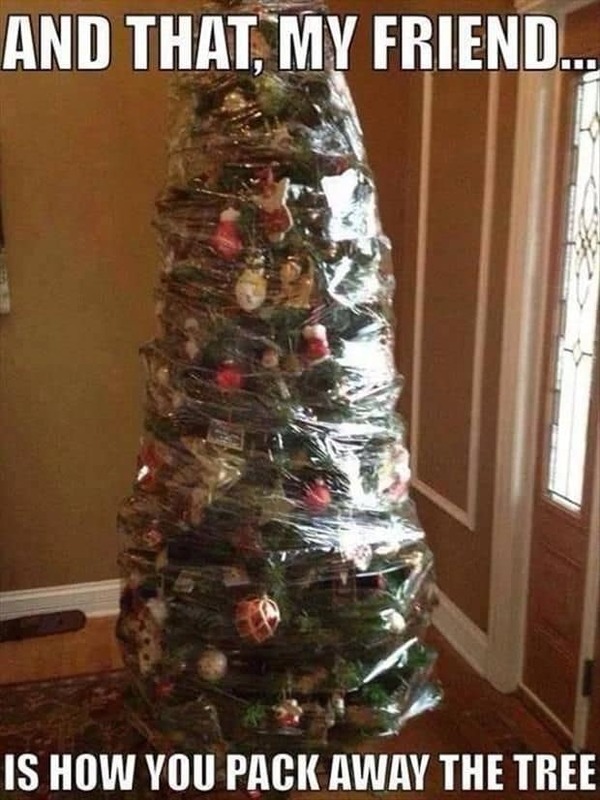 My new time saving Christmas tree invention.